As the Executive Director of the White House Council on Women and Girls, it is my honor to join Dr. Grant Colfax, Director of the Office of National AIDS Policy and Lynn Rosenthal, the White House Advisor on Violence Against Women, in announcing the next step in President Obama’s commitment to combat the spread of HIV/AIDS amongst women and girls. Please read on for more details. President Obama was joined by Secretary of State Hillary Rodham Clinton in a call to our partners—including government stakeholders at all levels, healthcare professionals, and HIV/AIDS service providers—to unite in an effort to usher in an “AIDS-free generation.” To reach this goal, it is clear we must address HIV among women, particularly among women of color. As directed in the National HIV/AIDS Strategy, Federal agencies are collaborating in new ways. We are embracing scientific findings to implement evidenced-based prevention methods in order to be more effective at preventing new HIV infections, and we are exploring new approaches to integrate prevention and care. As part of this ongoing collaborative approach, President Obama has issued a presidential memorandum establishing an inter-agency working group on the intersection of HIV/AIDS, violence against women and girls, and gender-related health disparities. The President has asked Lynn Rosenthal, the White House Advisor on Violence Against Women and Dr. Grant Colfax, the Director of the Office of National AIDS Policy, to serve as co-chairs. The working group will include representatives from the Departments of Justice, Interior, Health and Human Services, Education, Homeland Security, Veterans Affairs, Housing and Urban Development, and the Office of Management and Budget. We will also tap the wealth of expertise and experience of members of the Presidential Advisory Council on HIV/AIDS. In addition, representatives from the Department of State, the United States Agency for International Development, and the Gender Technical Working Group from the President’s Emergency Plan for AIDS Relief (PEPFAR), will share lessons learned and evidence-based best practices based on the global experience. When we address the domestic public health threat of HIV/AIDS, we cannot ignore the detrimental effects of gender-based violence and gender-related health disparities, particularly within underserved communities. 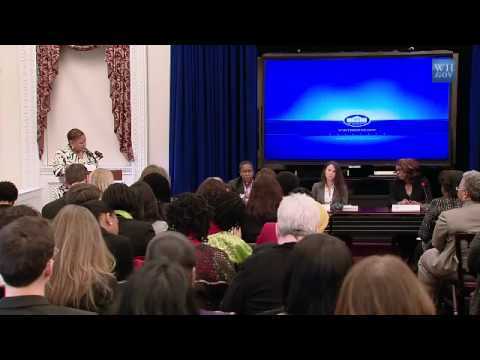 The Administration commemorated this year’s National Women and Girls HIV/AIDS Awareness Day by hosting a White House event to highlight how these intersecting factors contribute to poor health outcomes among women and girls. The meeting included expert panel discussions; announcements regarding several domestic and global initiatives; and dialogues with community members. The President’s directive builds upon the momentum generated at the meeting. It commits to an ongoing Federal effort to address the intersection of HIV/AIDS, violence against women, and gender-related health disparities through applying evidence-based strategies, engaging families and communities, supporting research and data collection, and mobilizing both public- and private-sector resources. For details on the mission and function of the Working Group, please see the Presidential Memorandum.